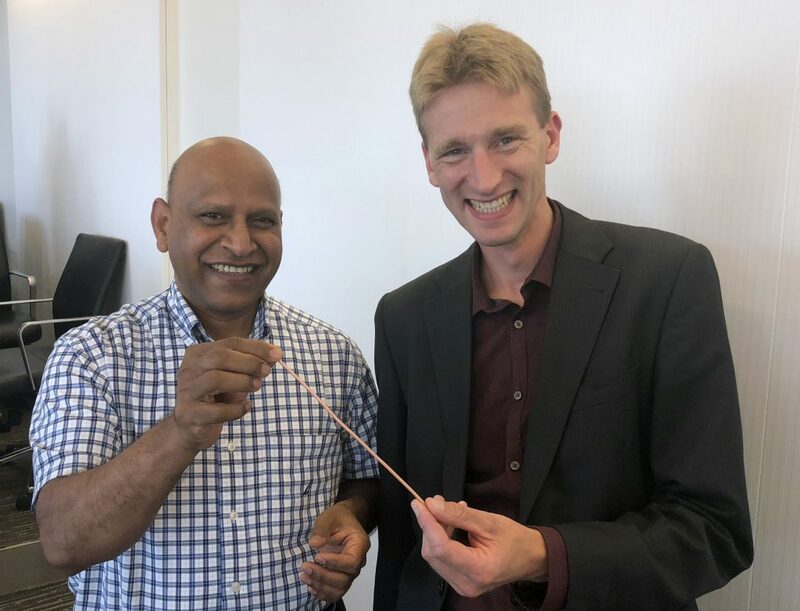 Danko van der Laan, president and CEO of Advanced Conductor Technologies and FAMU-FSU College of Engineering Professor and Associate Director of CAPS Sastry Pamidi show off Conductor on Round Core cable technology. Advanced Conductor Technologies LLC and Florida State University’s Center for Advanced Power Systems (CAPS) are taking a big step in the world of superconductor technology that could have major implications for naval, aviation and power grid applications. Through a grant program that encourages private industry to partner with university scientists, a research team from Advanced Conductor Technologies and CAPS worked together to demonstrate the first high-temperature superconducting direct current power transmission cable using Advanced Conductor Technologies’ Conductor on Round Core (CORC®) cable technology. These cables enable transmission of vast amounts of power at high currents that could be used to fuel power grids or help operate an all-electric ship. 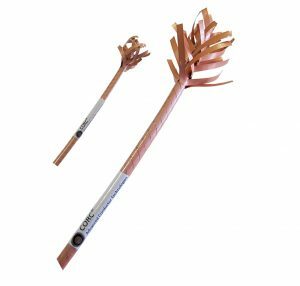 Advanced Conductor Technologies focuses on the commercialization of CORC® cables for the next generation of fusion and accelerator magnets and for power transmission applications. The two-pole direct current power transmission cable was formed by twisting two 10-meter long monopole CORC® cables together. The cable was cooled by pressurized cryogenic helium gas circulation and tested at currents exceeding 4,000 amperes. These cables are a major improvement on the current technology because they are much thinner, and thus smaller and lighter than other high-temperature superconducting cables. The CORC® power transmission cable was developed by Advanced Conductor Technologies and tested at CAPS as part of an ongoing collaborative program funded through a Small Business Innovative Research (SBIR) grant from the U.S. Navy. SBIR grants encourage businesses to find university partners to conduct high-level research. CAPS conducts research on advanced modeling and simulation of electric power systems, advanced controls, power conversion equipment and high temperature superconducting devices. CAPS has also long partnered with the U.S. Navy in developing technologies that would support an all-electric ship. The Navy has significantly ramped up its efforts to develop superconducting cables over the past decade. Increasing electric power needs on Navy ships demand more efficient means of transmitting the power equivalent to that used by a small city without almost any loss in a compact and lightweight system that can’t be achieved using conventional technology. In addition to Pamidi and Van der Laan, other scientists working on the project include Chul Han Kim of CAPS, Jeremy Weiss of Advanced Conductor Technologies and Lukas Graber of the National Electric Energy Testing Research and Applications Center at the Georgia Institute of Technology.